This week we welcome back Blythe Gifford as she celebrates the release of IN The MASTER'S BED from the Harlequin Historical line. Those of you who visit Unusual Historicals regularly, you'll recognize her as the author of INNOCENCE UNVEILED, set in medieval Flanders, and THE HARLOT'S DAUGHTER, inspired by the illegitimate daughter of the king of England and his notorious mistress. And, you'll remember that she is coming on board as a regular contributor to Unusual Historicals. So a double welcome Blythe! Disguised as a man in a place where women are forbidden, Jane de Weston meets a man who, for the first time, makes her want to be a woman. But what will happen when she'd discovered and he finds her IN THE MASTER'S BED? You've come back to medieval England for this story, so what makes it unusual? It takes place in a medieval university, Cambridge, (or Cantebregge, to be historically correct) and I don't know of many romances that have used that setting. (Readers, correct me if I err!) Susanna Gregory set a series of mysteries there, however. And Keena Kincaid's ART OF LOVE is set in the abbey schools that eventually became the University of Paris, but roughly two hundred years earlier than my story. How did you decide on a university setting? Those who read THE HARLOT'S DAUGHTER--though you don't need to have read it to enjoy this story--may recall that the harlot's other daughter, Jane, was already what we would call a "tomboy." She had studied a little Latin, so I always knew that in her story, she would run away, dressed as a lad, to make a life for herself that was very different than her beautiful sister's. A university was the ideal answer. Why Cambridge instead of Oxford? I had originally planned for Jane to go to Oxford, but I weave real people and events into my stories, and when I discovered that Parliament met in Cambridge the year my story was set, everything fell into place. The visit of Parliament and King Richard II play an important role in the story. You've told us a little about your heroine. How about your hero? Duncan is a master at Cambridge, so an accomplished man, but he's far from the stereotypical scholar. He values the body as well as the mind. 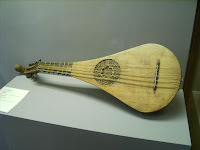 And he plays the guitar, or the medieval equivalent, the gittern. His home is near the Scottish border, in northeastern England, and in those days, that was considered a land of barbarians. So Duncan has a bit of a chip on his shoulder. He's had to prove himself to all comers at Cambridge. And he has. Any "Easter Eggs" in the book, that is, hidden surprises for your readers? Well, this is my fourth published work to take place in the 14th century, and somehow, Geoffrey Chaucer has snuck into almost every one. 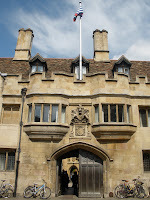 In his Canterbury Tales, "The Reeves Tale" is the story of two Cambridge clerks from "Soler Halle," which was thought to be stand for King's Hall, or King's College, or Garret Hostel, depending on which scholar you believe. I adopted that as the name for my hostel, calling it Solar Hostel. What did you learn about the medieval university? More than I could incorporate in the story! When I started researching medieval higher education, I was struck by how different it was from what we know today. By the end of the fourteenth century, when I set IN THE MASTER'S BED, the university was no longer only for monks, but it was still for a special few--all of them men. Women were forbidden in the classrooms and the living quarters, even to do laundry. While I set my story at Cambridge University, what I learned largely applied to Oxford or any of the institutions on the continent. So tell us what was so different about it? **A young man could go to University at age 14 or 15. If he completed the most advanced degree, theology, he could very well be there until age 30. **Latin was the universal language of education, so an educated man could travel from Italy to Paris to England and still communicate with his fellows. And when I say language, I mean that they spoke Latin to each other. **The list of topics studied was short. The seven "liberal arts" were the trivium (think trivia) of grammar, dialectic, and rhetoric, followed by the quadrivium of music, arithmetic, geometry, and astronomy. **Books were scarce. Often, the classes consisted of a master reading aloud from a required text. That doesn't sound much like higher education today! **Those young men who attended were not the nobility, knights, nor peasants. They were the sons of the newly emerging middle (merchant) class, hoping that education would help them advance in a career, typically in administration at the king's court. **Sometimes they had a career goal, but as time went on, they attended more for social polish and general cachet. As many as 80% attended without ever completing a degree. **For those who went on to a higher degree, the top choices were law, medicine, and theology. **An initiation hazing ritual had to be endured in order for a beanus (freshman) to be accepted into the university "tribe." The word later became "beanie" and applied to the freshman headgear required on college campuses as late as the 1960s. **Students wrote home begging for money. There were even guidebooks with sample letters, telling them how to do it! **Drinking was rampant. As Hastings Rashdall put it in The University of Europe in the Middle Ages, "no important events of life could be got through without drinking." To stand a round for one's fellows was the common reward, or punishment, for a variety of events, from obtaining one's degree to losing a bet. **Colleges continually tried to prohibit loud singing and playing of music, dancing in the streets (men dancing--no women involved) and dramatics. Most of these, of course, were the result of the aforementioned drinking. The regularity of these pronouncements suggested their ineffectiveness. As I learned all this, I became much more comfortable creating my story in the world of the medieval university. Human nature, particularly the human nature of young men living in groups, is still recognizable seven hundred years later. I really enjoyed throwing my hero and heroine together in this challenging world. And, of course, letting them find a happy ending! Thanks for joining us today. You're offering a prize for a lucky commenter, right? Yes, indeed. I'll be giving away a copy of IN The MASTER'S BED to someone who leaves a comment. And I invite readers to check out my website. I'm embarked on the "Blog Until You Drop" tour and I'd love to have readers join me along the way--and, of course, to sign up for my e-list. And you'll be back here next month. Right. I'll be posting on Scandals on September, telling more about that "notorious mistress" who is the mother of both Solay and Jane: Alice Perrers. 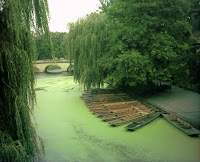 Captions: A gittern (public domain); Pembroke College, a 14th century gatehouse (public domain); and a photo of the River Cam and willow trees, similar to those Jane and Duncan sat under (Cruccone). You heard it here! Leave a comment or question and you'll be entered for a chance to win a copy of IN THE MASTER'S BED. Void where prohibited. I'll draw the winner next Sunday. Good luck, and thanks again to Blythe for stopping by!